New Delhi [India], Sept 28 (ANI): India and Bangladesh have proposed early conclusion of a Compressive Economic Cooperation Agreement (CEPA) to boost bilateral trade and investment and set an example for giving a fillip to regional trade in South Asia, Union Commerce and Industry Minister Suresh Prabhu said on Friday. Speaking at the launch of the World Bank Group’s Regional Trade Report at Federation House, on return from his Bangladesh visit, Prabhu said that India and Bangladesh have agreed to upgrade trade logistics for seamless movement of cargo. In the same spirit, he said, India would be willing to engage with its South Asian neighbours to reap the advantages emanating from similar agro-climatic conditions, topography and crop cultivation. He urged the World Bank to explore the potential offered by services trade in the region. 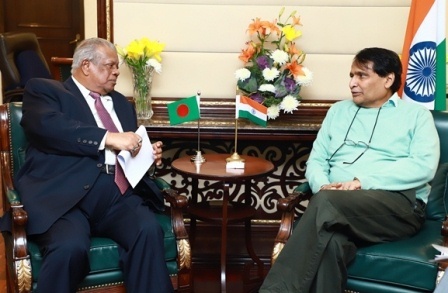 Prabhu added that he has invited the Bangladesh Commerce Minister and senior officials next month to identify the opportunities of investment from India to Bangladesh. Presenting a snapshot of the Regional Trade Report, Dr. Sanjay Kathuria, Lead Economist and Coordinator, South Asia Regional Integration, the World Bank Group, said regional cooperation can lay open to India the potential to more than triple its trade with South Asia from the current level of $ 19.1 billion to $ 62.4 billion. He added that in order to realise the benefits of proximity, addressing regional trade barriers was pivotal. He mentioned that average tariffs on South Asia are double the world average and there was a lack of awareness among exporters regarding the partner country’s regulations and standards. This called for a proactive approach, led by India, to address information asymmetries and accelerate mutual recognition of standards. Kathuria said that India could play a lead role in making SAFTA effective, create awareness, building capacity of partner countries to remove the ’noise’ related to non-tariff measures, expand and accelerate the connectivity agenda with neighbours, take new initiatives and scale up existing trust-building activities through people-to-people contact. The report suggested an eight-point South Asia trade integration strategy that includes articulating the trade strategy, phasing in trade liberalisation in sectors where there are concerns about large job displacement, implementing strategy to diversify sources of tax revenue. It also suggested focusing on critical reforms that would help the economy and the private sector take advantage of trade liberalisation, including improving trade facilitation, attracting high-quality FDI, and addressing key issues that constrain the ease of doing business.